Illinois Central College’s 36th Annual Landscape and Garden Day offers a variety of special programs and activities specifically designed for families with young children as well as the usual favorites for local gardening enthusiasts. This year’s theme is “Pollinators, Plants and People – A Great Combination”. The free event is set for Saturday, September 10, from 9 am to 3 pm, at ICC’s Horticulture Land Lab on the East Peoria Campus. *** Due to wet conditions near the Horticulture Land Lab, parking will be available in the CougarPlex parking lots A2 and B2. 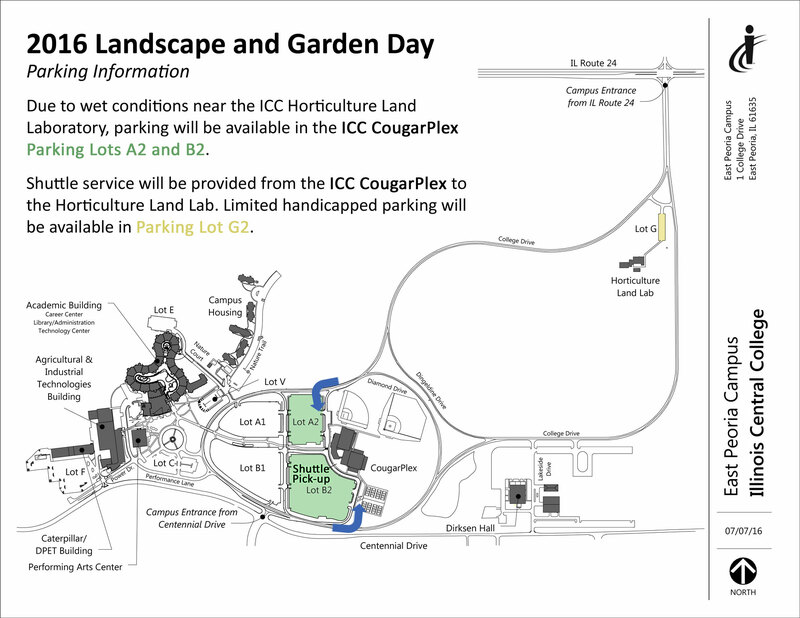 Shuttle service will be provided from the CougarPlex to the Horticulture Land Lab. Limited handicapped parking will be available in Lot G.
The event features topics and demonstrations of interest to gardeners of all ages and experience levels. The newest winners of the All-America Selection, which include the best and brightest new flowers and vegetables available for next year’s home gardens, will be showcased. Golf enthusiasts can enjoy the ever-popular “Putt for Plants,” and taste-testing will be available at the vegetable garden. 9:30 – 10:15 am: “Unordinary Pollinators” – Come join us as University of Illinois Extension Master Gardner Margee Karl introduces us to “Pollinators of the Unordinary Kind”. Margie has been a U of I Extension Master Gardner since 2004 and a speaker for the U of I Extension Speakers Bureau for more than 10 years. This is a beautiful and unique presentation! She’s sure to entertain, amaze, surprise, and educate you. 11 – 11:45 am: “Pollinator Power: How to attract them and keep them coming around.” – Presenter Suzanne Cook is a 19-year Tazewell County Master Gardener, Head Gardener for the Pekin Park District, and has written a garden column for the Pekin Times for 20 years. She’ll give participants a long list of easy-to-grow plants. She especially loves growing plants to attract butterflies, bees and hummingbirds. And, she promises there WILL be prizes available! 1 – 1:45 pm: “But I Don’t Know How To Keep Bees…Yet!” – Presenter Bill Baker is currently the Central Director for the Illinois State Beekeepers Association and a past president of the Heart of Illinois Beekeepers but says he’s is still learning how to keep bees. He has found beekeeping to be fun, relaxing, frustrating and a great overall learning experience.